When you first embark upon cloth nappies for your little one, it can seem a little daunting. There are whole communities out there dedicated towards educating parents about the benefits of reusable nappies, and often the terminology and types of nappies available can make your head swim! But don’t panic- here are some quick tips to help you, and a brief guide on cloth nappies for beginners. Each year in the UK around 8 million nappies are thrown into landfill. Every year! And the plastic in those disposable nappies is thought to take hundreds of years to decompose. So when you think of the impact that disposable nappies are having on the environment, it doesn’t take much to convince some parents that the switch to reusable is a good idea. And although cloth nappies will mean an extra load in the washing machine, the impact that this will have on the environment is nowhere near the same. Alongside the affects on the environment, cloth nappies can have an impact on your family budget too. It’s been estimated that the average UK family will spend up to £800 on nappies per child- that’s quite a lot of money! Using cloth nappies could bring this expense down considerably. You can buy a cloth nappy for around £10-20 (an initial expense, granted) and that nappy will last for as long as your child is in nappies. If you have around 10 nappies in total, you’re looking at spending no more than around £200- a huge contrast to £800! Another major reason why lots of parents choose to opt for cloth nappies is the fact that they don’t contain any nasty chemicals. Disposable nappies contain different chemicals so that they can be absorbent, and if you’ve ever seen a nappy split open you’ll see what we mean. Those little ‘crystals’ work to absorb urine and to keep it away from the skin, but they do mean that your baby’s precious skin could be at risk from irritation. Cloth nappies do not need such chemicals and therefore are deemed to be kinder to skin. 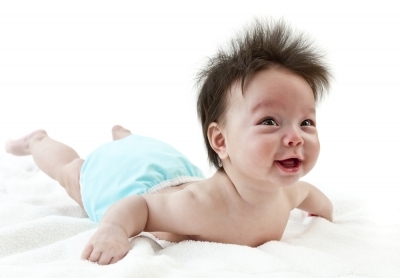 Research the different types of nappies available. • All in ones – these are the closest you will get to a disposable nappy as the whole thing is sewn together in one piece. • All in twos – are very similar to disposable too, and have lots in common with all in ones – the only difference is that they have inserts that snap in or lay in the nappy. • Fitted/shaped nappies are shaped like a disposable nappy but they are not waterproof so you need a cover over the top. • Flat – nappies that are not shaped and need a cover to be waterproof. • Hybrid – these nappies have a waterproof outer (wrap/cover) and inserts that are laid into it. • Pocket – are a type of waterproof cover with a pocket in it. An absorbent insert fits into the pocket and then the nappy goes on all in one piece. If you can access a nappy library or similar, see if you can have a play with some of the nappies there before you buy- see if you like the look, if they seem ok to use, and if they are within your price range too. Lots of nappy brands will offer trial kits and some sites allow you to borrow nappies and return them when you’ve had a trial- both handy services to take advantage of. Not all cloth nappies are the same size, and some are better for younger babies, some better for older babies. Some nappies are one size, which means you can use them from newborn and adjust the sizing as on the nappy as your baby grows. These are the best value for money but they might not be right for your baby. Research as much as you can and read as many reviews as you can too. Each nappy type will have a range of sizes available so you might want to stock up on your favourite too. It’s often the washing that puts parents off cloth nappies, but there really is no need! These days cloth nappies don’t need to be soaked before you wash them, so if you have a nappy bin with a lid you can store dirty nappies in there until it’s time to wash. You need to wash the nappies on a hot wash (around 60 degrees) and there is no need to use a specific nappy detergent, unless you want to. If using normal washing detergent, make sure to use just a quarter of the usual amount and no fabric conditioner. It’s a good idea to end each cycle with an extra rinse too. If you have enough nappies, you will only be washing them once a week, so make sure you have somewhere to store them in between washes. Let them dry on the line or on an airer in the house- they should only take a few hours.